Jamie McDonnell dismissed Julio Ceja's fearsome reputation to claim the vacant IBF bantamweight title with a controversial majority decision win at the Keepmoat Stadium in Doncaster. McDonnell, who lost two successive fights five years ago and looked to be going nowhere, had worked his way up the rankings to earn the shot and took it with both hands. However, he seemed to have lost his chance against Ceja, whose powerful work looked to have done enough to win the belt on away turf only for contentious scores of 114-114, 115-113 and a frankly ludicrous 118-110 to hand it to McDonnell. McDonnell, 27, brought a record of 20-2-1 with nine stoppages into the bout, compared with Ceja's formidable 24-0 tally with 22 knockouts. The 20-year-old Mexican was understandably the favourite heading into the bout, boasting such an impressive record. However, little was known about his previous conquests and he had never previously fought outside of his own country. His maiden overseas contest could hardly have been more of a culture shock, going into the lion's den and fighting outdoors on a cold night in South Yorkshire. McDonnell - who admitted this week he does not even particularly like boxing - came to the ring to The Killers' Mr Brightside, welcomed by around 3,000 enthusiastic fans. McDonnell edged the opening round by rightly boxing carefully and keeping Ceja at bay, landing more jabs in a quiet opening. Ceja took the second, however, landing more clean shots as McDonnell looked to stay out of harm's way. A left hook to the body was his best work as he walked the Yorkshireman down constantly. McDonnell landed a nice combination on the counter in the third, but again Ceja looked impressive, winging in left hooks to head and body when the opportunity arose and finishing the round well with a jab-right double. McDonnell landed decent lefts to body and then head in the fourth but needed more of the same to give himself a chance. Ceja was bullying him, though, a right to the body and an uppercut crashing home painfully. McDonnell edged the fifth by upping his work-rate, but Ceja still managed to land three big rights over the course of the session. Ceja was back on top in the sixth as the Englishman's lack of power looked to be costing him McDonnell had a much better eighth round, using his speed to land three and four-punch combinations. Yet every time Ceja did manage to land, it looked painful. McDonnell's slick skills were more apparent in the ninth. To his credit, McDonnell took Ceja's meaty power shots incredibly well throughout, not least in the 10th. A Ceja left hook in the 11th was the punch of the fight, landing cleanly on McDonnell's chin. Yet still the Briton swallowed it and carried on. McDonnell finished strongly in a thrilling final round and the judges' scorecards rewarded him for his durability, albeit highly controversially. 'Oh my god, what an amazing feeling,' said the new champion afterwards. 'In the first five rounds or so I felt him out and wanted to come on stronger as the fight went on. 'I started digging him in the last few rounds and I felt I could have even got the stoppage. John Simpson beat Choi Tseveenpurev for the vacant WBC International title at the Emirates Arena in Glasgow. After 12 tough rounds the judges awarded the contest 116-112, 117-112, 116-113 to the Scot with his opponent racing from the ring in disgust after the announcement, before returning to take a bow. 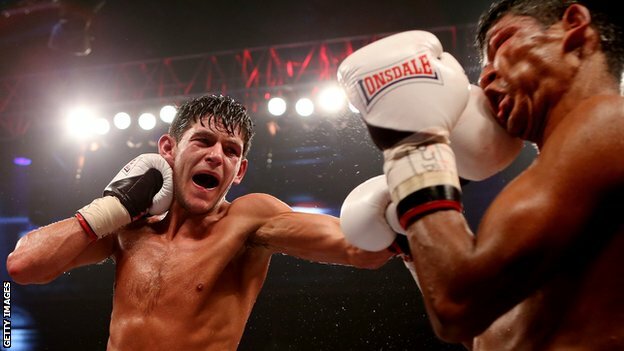 Doncaster's Jamie McDonnell delivered the performance of his life to beat Julio Ceja and become the new IBF world bantamweight champion. The 27-year-old won a narrow points victory over the unbeaten Mexican at the Keepmoat Stadium in Doncaster. The Englishman seemed to grow in confidence following some nervy opening rounds against a dangerous fighter who had knocked out 22 of his 24 opponents. And in the end McDonnell had too much for Ceja in a hugely entertaining bout. McDonnell told Primetime: "What an amazing feeling, it's unbelievable. "I was enjoying that, I wouldn't have minded a couple more rounds to get the stoppage." Around 3,000 enthusiastic fans helped to cheer McDonnell to victory - which may have influenced the scoring of one judge who had it 118-110 in McDonnell's favour when in truth the bout was much closer. The Yorkshireman delivered a rousing performance following that slow start against a 20-year-old who already had a fearsome reputation. Ceja landed some powerful right hands throughout. But McDonnell rarely looked in too much trouble, absorbing the Mexican's power and landing some classy shots of his own. The fight increasingly ebbed and flowed before a thrilling final round in which McDonnell just did enough to stay ahead of Ceja on the judges' scorecards. Promoter Dennis Hobson said: "It's great, he's a special talent. The best thing is he's still improving, how scary is that?" 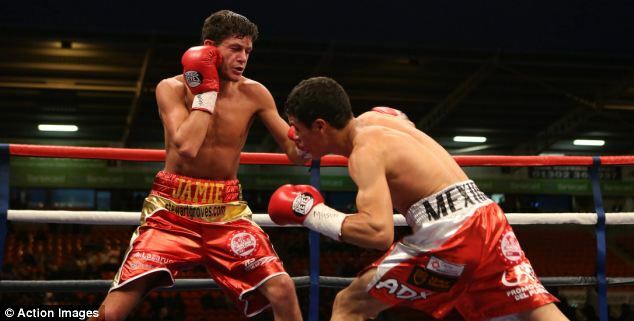 Jamie McDonnell has become Britain's latest world champion, beating Julio Ceja to claim the IBF bantamweight title. The 27-year-old won a majority points decision in his home town of Doncaster on Saturday evening with scored of 118-110, 115-113 and 114-114. After a cagey start against the big-punching Mexican, McDonnell grew into the fight and showed grit and determination to win the title. McDonnell worked behind his rangy jab in the opening round keeping Ceja at bay, but the 20-year-old, who was previously unbeaten, started to find the Briton with some powerful shots in rounds two and three. The home fighter came back in the next two rounds, landing some nice combinations on Ceja and keeping his work rate high enough to win the rounds. They continued to trade blows throughout the next couple of rounds, before the Mexican started to feel the pace; however, he reminded McDonnell that he was still there with two big shots in round 10 and a huge right hook in round 11. McDonnell managed to regain his composure, though, and finished strongly to take the title much to the delight of his home crowd.